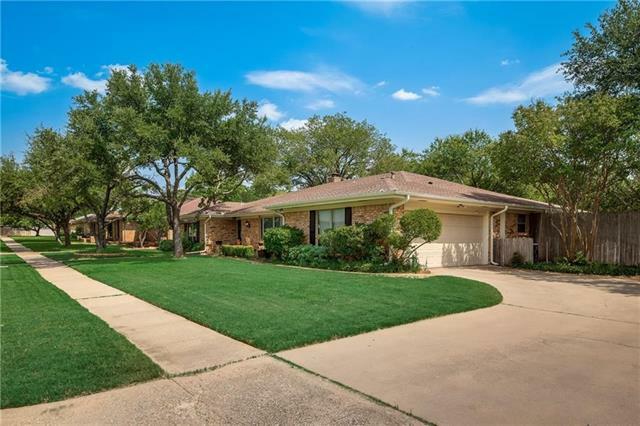 All Pantego homes currently listed for sale in Pantego as of 04/23/2019 are shown below. You can change the search criteria at any time by pressing the 'Change Search' button below. If you have any questions or you would like more information about any Pantego homes for sale or other Pantego real estate, please contact us and one of our knowledgeable Pantego REALTORS® would be pleased to assist you. "Welcome to your dream home. This home features beautiful wood floors, granite counter tops, and 2 living areas with fireplaces. Imagine entertaining friends and family poolside on a warm sunny day. The home is 3119 sqft with 4 bedrooms, 3 bathrooms, and large laundry room. The 4th bedroom is a Mother-in-Law suite. The neighborhood and community give you that small town feel even though you are right next to Arlington and have easy access to major highways. There is a nice park right around t"
"Beautiful one story brick home featuring 4BR 2BA located in Shady Valley Acres! Fresh two toned interior and exterior paint. New flooring throughout. Spacious living room upon entry. Open family room with brick fireplace. Bright kitchen accents new granite countertops, freshly painted cabinets and new stainless steel appliances. Spacious master bedroom with private bathroom. Minutes from shopping and dining. Close to Lake Arlington. Come view this home today!"